Who Is the Real Hero Paradise Lost, but only temporarily...we'll be back. In John Milton’s Paradise Lost the tragic figures are Adam and Satan—Adam because he succumbs to mortal weakness and Satan because of his fall into the dense fields of matter and time. The high strangeness of the story is the fact that John Milton died on the same date as the Paradise fire, November 8. Most people who have read Paradise Lost banter back and forth about who the real hero is but I have a totally different idea of who the hero is in this story. The story is told from the perspective of a third person so in a sense, the real heroes in this world are the storytellers who are able to tell the story in such a way that others can, in a Heinleinian sense, “grok” the meaning of what is going on. What I’ve noticed lately is that most people who tell their story of tragedy and loss, anguish and fear, are telling it as a deeply involved third-person account of the events they experienced. It takes a lot of conscious awareness to tell it like it is and not fall into the depths of chaos and self-pity, which continually amazes me. This is what it will take to make this our story, a story of Paradise Awakening, our collective journey to become the heroes in our own story. So, what will it take to be the hero in our own story? It will take what every story has demanded through time; it will take speaking out when no one else will or can, it will demand taking actions based on well thought-out research regardless of old dysfunctional outdated rules and regulations, and most of all, it will take standing on the shoulders of other brave souls so we can look further over the horizon of what most people think is possible. I recall going to a council meeting here in Paradise a couple of years ago when everyone was invited to speak about the legalization of medical marijuana. Everyone there who spoke was for the legalization except one person who stood up to speak against it. He was against it because some kids, whom he assumed were high on marijuana, destroyed his mailbox. Other speakers tried to explain that in all their years of getting high, none went around destroying mailboxes. Truth be told, the kids were probably high on meth. But my point here is that the whole meeting turned into that one negative comment that was probably wrong. The disconnect between the city and the residents would have been embarrassing to anyone who was aware. But we all walked out after the 3-to-2 vote against the legalization and didn’t say much or address the fact that we were not represented by our “representatives.” We can no longer afford to be apathetic to this disconnect with local officials. Our communities here in northern California do not belong to elected representatives; our communities belong to us. I’ve been telling people on my radio show for a couple of years now that we need to learn the proper spelling of the word justice and spell it like it is: “Just-Us.” The sooner we realize this the better. I think it’s time to take a hard look at history and learn from it. Our presidents, czars, emperors, and kings have never really accomplished anything lasting for the welfare of the common person; it’s always for their elite circles disguised as helping the people in some altruistic way. Margaret Mead once said, “Never doubt that a small group of thoughtful, committed citizens can change the world; indeed, it’s the only thing that ever has.” But because we have been disempowered by everything from our educational system, our financial systems, governments, and extreme religious beliefs, we have lost sight of the power we have in creating and manifesting a better and more equitable life for everyone. Like it or not, we are awakening from the American Dream and realizing that all is not what it appears to be in the world. Almost every war has been fought on false premises that are now out in the open, our legal system exists only for the rich and well connected, our public educational system is an embarrassment in many parts of the world where they value the youth above all else, and the way we care for our elders would be criminal in some parts of the world. But the masses are so dumbed down that even though 38 percent of the American public no longer accepts the official story of 9-11 or the fact that more than 70 percent of the American public believes that we are being visited by unidentified flying objects in our atmosphere, I, along with many others, are labeled conspiracy theorists by the corporate media. We live in such a polarized society that it’s impossible to have a dialogue about whether President Trump did something good or bad—either way you have half the country up in arms and outright hating you. Even now I am hesitant to publish this article but this is what I mean about being the hero of your own story; right or wrong, we all should be able to voice our opinions in the face of whatever and whomever is out there. Once again, as we look back in our planet’s history, we should keep in mind the fact that every ancient civilization is either in ruins or has been completely wiped off the face of the Earth and every one of them had it in their heads that they would last forever … until they didn’t. 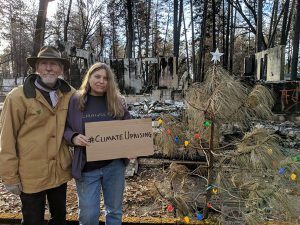 As our northern California communities such as Paradise rebuild, we would do well to realize that it will never be the same, nor should it be; why create the same situation that got us where we are today? Like it or not, we have been “reformatted,” which gives us a chance to create something amazing and different. This has to be our decision because it’s us who will be living out our lives here, not the Rothschild-owned PG&E, not the federal agencies, it’s us, Just-Us, who need to stand up and demand a change in how we want to live out our lives. So, regard this as a “call to take action,” a call to all of us to speak up and a call to the local representatives to start listening to the very people who put them in their positions. We all see trees that are perfectly healthy being chopped down and hauled away by what can only be called “catastrophe profiteers,” and we see PG&E replacing electric poles that were burned down by yet another wood pole and not even upgrading all of their electric lines to some of the better-insulated lines needed in forested areas. Isn’t this the definition of insanity? This would be the perfect time to bury a lot of lines and at the same time add fiber optics for high-speed Internet, but instead, the powerful communications agencies such as the FCC are “deploying” 5G technology (read my article in this issue and listen to a show I did on this at www.BBSradio.com/SpiritualActivist). We have a window of opportunity to stand up and speak out and demand our rights as living and breathing human beings. Remember this above all else: We have inalienable rights that cannot be taken away; they can only be given away. Important Update: You probably don’t know this but there’s a legal way to hold “people” financially responsible that have traditionally hid behind corporate shields. They are doing this in other countries like Canada regarding Smart Meters. Listen to my interview with Cal Washington who is behind this movement at www.BBSradio.com/SpiritualActivist.